At first glance you may think you stumbled into a counseling session. Then you realize you’re in a human services classroom at Tidewater Community College. “It’s really hard dealing with family when we are not accepted,” says Justin Fleming, role playing being married to Pamela Nobles. “It’s an emotional rollercoaster,” adds Nobles. Christina Byrd, acting as the counselor, kept the conversation on track and gave the “couple” some ideas on how to handle their disapproving families. TCC’s Associate of Applied Science in Human Services prepares students to provide much-needed support for teens in crisis, families, the elderly and countless others. Coursework includes basic counseling skills, various functions of crisis intervention, the management principles of human and social service and the skills needed to address the needs of patients and clients from a counseling perspective. Additional focus is placed on the process of case management. “Students are learning skill sets, as part of their tool box to make a difference in people’s lives,” Warren adds. “Most of my students have experienced problems and overcome, and now they can be change agents for others in similar circumstances. The Human Services program, a signature program on the Norfolk Campus, has grown to over 300 students in the last two years. Warren attributes the growth to her mother-hen approach to program management. Linda Little, also a first-year student, adds, “I decided to come back to school so I could do something different. I’ve learned a lot because of my own disability and I want to give something back.” Little, 61, is wheelchair bound and attending classes on a senior waiver. 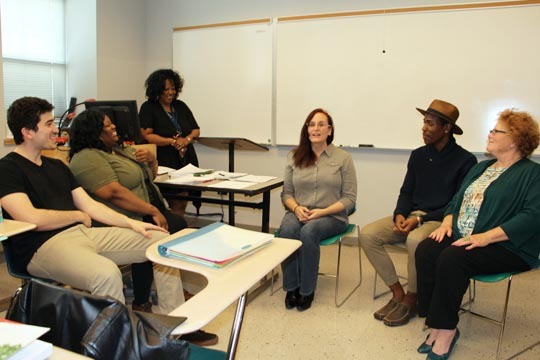 Human Services classes are offered face-to-face at the Norfolk and Portsmouth Campuses and online. New online courses to be added this year include Case Management and Substance Abuse (HMS 258) and Helping Across Cultures (HMS 226).